Never during my visits to Mumbai I had a chance to stay in Taj Mahal; it was always booked solid. I am sure I won’t be staying in that symbol of luxury any time soon. As a matter of fact, I am not sure it will be as high in demand as it was for some time now. Terror atrocities are not new to India, as but till now they were mainly off the radar for many of US execs. Last couple days will change the landscape for a long time. As a matter of fact for many IT execs of my generation the word “Kashmir” has stronger association with Led Zeppelin than with ongoing unrest and terror. Of course there will be changes in hotel security and city security altogether, there will be strong government actions, and so on. Of course people will eventually forget victims and the horror inflicted on the city by well organized militias, yet traveling to Mumbai won’t be the same for a long time. The difference with emotional impact of slams and extreme destitution you see on the way from airport to a beautiful downtown and physical clear and present danger is huge. Today National Outsourcing Association (NoA) tells us not to travel to India unless we have to or at least think twice even though Nasscom said the country’s software and services companies remain fully operational. Tomorrow safety of your resources stationed in India or your business travel might become an ongoing concern. I have seen companies bow out of outsourcing engagements on less violent news. Hip hip hooray, the crystal ball is unveiled, and early predictions for offhshoring are out – IT Offshore Outsourcing: Early Predictions for 2009. Looks like there will be more business coming to the offshore vendors despite all the economic turmoil. I bet the jury is still out, as a matter of fact, the survey of 230 CIOs must have taken some time to process and summarize. The figures we are seeing today (DOW at 7500) are based on the data which probably goes back at least a few months (when DOW was let’s say at 12000). My predictions are on a negative side, nowadays more than before, I expect notable deflation of offshoring business that will hit hard small suppliers in particular. I am sure we’ll see a wave of unpaid invoices, team buy-backs, and price wars. One of the proven methods to improve quality of communications with the offshore team is to have a dedicated person to coordinate and oversee its activities from your site. This person should ensure the communication flow, act as liaison between the teams, and often interpret information from local to offshore language. Even if the both sides speak English fluently (e.g. outsourcing to India) there is lot of subtle differences in business lingo that need translation. More so the person could be charged with business analyst activities interpreting domain specifics to technical language of the development team. On my book offshore manager should have very solid PM/PMO skills, in-depth understanding of the processes such as SDLC, strong knowledge of the domain, and of course understanding of the offshore. The job description for the person quickly adds up to a very tall order. Add to it logistic challenges – this person typically ends up working long odd hours – and you realize that it’s not an easy task to find some who can do it. Of course I am not the one who invented dedicated offshore managers, as a matter of fact even for a fairly small engagement your vendors would strongly recommend that you put a full time onsite coordinator on your team. The vendor is likely to have long list of Pros for adding the person to the team, not surprising it’s a very common add-on sold pretty much with every contract. Onsite coordinator could be just a slightly disguised sales executive with primary objectives that have nothing to do with real objectives of offshore manager. Onsite coordinator could be grossly unqualified for the job but given it due to some internal reasons – for example as a holding position between assignments. Most often the onsite coordinator is just that – a mere coordinator – far less than you need for the position. Each of the scenarios above is guaranteed not to deliver on the objectives of an offshore manager and to prevent engagement failure you’ll need to invest in the manager as well, in that case why do you need coordinator? More so, one of the biggest issues with offshore onsite coordinator is the mind set, is s/he going to have your interests at heart or interests of the company which pays him salary? When inevitable problems come up on what side s/he will be? Let’s say that problems are severe and you have to take your vendor to court, can you really count on onsite coordinator to be unbiased? I can not tell you how many times I had this discussion with offshore vendors who continue to push for the “best practice”. Well, if that’s so helpful for you to deliver on the engagement objectives why don’t you do it on your own expense? That question typically falls on deaf ears. When you consider expense, typically either offshore rate + per diem / hotel / car / etc. or onsite rate of ~$80 an hour you realize that it’s might cost effective to find offshore manager locally. Good offshore managers are not easy to find and they are not cheap but believe me, they are worth every penny. It’s irrelevant. These are not employees I am hiring, why would I care about their personality? It’s the same as with local resources: what’s good for the home team is good for the offshore. I let my gut decide or I am good at reading people and I do not need any help here. The first one is the easiest. Of course it’s relevant; just think about how much damage a QA engineer without attention to details can do, or how much “value” a Project Manager with no appreciation for authority and processes would bring to a project. Why isn’t it the same in that case? In some aspects it is, for example for your staff QA engineer you would be interested in someone who has great attention to details, eye for imperfections, appreciates structure and processes, doesn’t mind repetitive work, etc. All these personality traits would be great assets for your offshore QA engineer as well. The difference comes with dynamics of the employment arrangement. Generally you can not count on keeping offshore resources on your project over two years, after that they are likely to move on; as a matter of fact for the purposes of personality casting you would be looking for just one year in offshore case; hopefully you have a better longevity with local resources, let’s say 3 years. Over that period of time some personality traits will play a role that are not as important when it comes to one year. For example you are looking at résumé of someone who changed his job once a year; that might be a showstopper for staff position but could OK for offshore resources. What about their ambitions, desire to learn new technologies, track record of continuing education, etc. Many aspects of personality become irrelevant when you are looking for offshore resources or turn to opposite. Another important aspect of personality interviews is the team diversity. I am not talking about race, religion, etc. instead it’s a diversity of the team. I believe in diversity of personality and when building local teams I prefer to have a well balanced but diverse team. For example you need people with “big picture” view as well as “detail” view; you need process fanatics and “break all the rules” mentality. When properly cast and well balanced diverse teams perform much better than homogeneous organizations. Of course casting is a key here, e.g. you do not need a social butterfly to work nightshift processing firewall logs. When it comes to offshore team diversity could mean unnecessary complexity and unpredictability. One more important consideration in that regard is the fact that careers of offshore resources are not in your hands. In that light again many aspects of personality become irrelevant when you are looking for offshore resources or turn to opposite. Now, on “I let my gut decide” topic. That’s a common approach to personality interviewing not only in offshore but for staff position all across the industry. I know that some managers are just darn good at reading people and even they make mistakes. I consider myself above average in that skill, mainly because I invested great deal of effort and education in it, and yet I make mistakes, sometimes serious ones. If your gut (intuition) can pinpoint attention to details, ability to strive under pressure, appreciation for processes, impeccable integrity… or an another side dishonesty, habitual irresponsibility, lack of work ethics… well, you probably are working as FBI profiler or psychic reader :) Intuition is important and you should listen to it, no doubts about it. You just should not rely on it or just only on it when selecting members of the team, especially when working remotely, over a phone, and across the cultural differences. Simplify an ideal personality profile. For example for Black Box Tester I’d be looking only for several personality traits absence of which would be a show stopper: attention to detail, ability to handle stress, and respect for the structure / process. Communicate the desired profile to my vendor with a hope that the screening catches at least obvious mismatch cases. Prepare a few open-ended questions that cater to discovery of those specific traits. For example, “Based on your prior experience please describe a situation when you ability to handle stress helped deliver on engagement objectives”. Take the answers for the face value. If the candidate can fake the answer hopefully they can fake the personality trait till the time the move on to a different project. I usually have a few questions ready but do not necessary ask them all. Sometimes the candidate would fail a few ones just because those are unusual questions, not something they have been condition to hear. But if they can’t learn the drill after I’ve asked them a few questions, it’s not the person I’m interest in hiring anyway. The first set of interviews is typically performed during vendor selection stage. The goal of this interview process is not to pick members for the team; instead it is to form your opinion of the vendor capability to build a team. I typically use a speed-dating style interviewing with individual interviews limited to 20 minutes covering ~20 people a day. It is important to have at least two people involved in the interview process working together, one of the main reason for that is a continues feedback and support they can provide to each other to stay on the top of the process and increase quality of discovery. During this speed-interviewing marathon I am not particular interested in individual performance of the team members. I do make a note of people I really like, in case if the vendor is selected these people would make good prospects for the team. For each of the position you would need to outline rough requirement s, for example Tech Lead may mean 7+ years in SW Development, 5+ years in Java, 5+ years in managing a team for 5+, etc. That list should keep you busy for a couple of days. Create list of questions for each position. There are a plenty of websites offering tech interview questions and answers. I recommend creating cheat sheets with Q & A and printing them for the interview sessions. Keep track of interview progress with a simple spreadsheet. Below is an example of table. I use 1 – 10 rating. Sharing the results with me vendor is a good idea, especially if the vendor is one of the winners of the race. Chances are that would be a humbling experience for the vendor. When it comes to interviewing people for specific roles on the team during team ramp up or when replacing the team members speed-dating style is not going to produce the results you are looking for. You will need more close and personal interviewing style with substantially higher investment on both sides. The document should cater to several audiences: internal, vendor and potentially the candidate. The better is the document the higher the chances of finding the right match; share as much of the details with the vendor as you can possibly gather at the point of recruitment. Next step involves securing and organizing Interview Squad – the team that will be involved in the process of resource selection. Make sure to clearly define roles and responsibilities of the team members, communicate job requirements, outline the process, and agree on techniques. During interview you will need to accomplish three basic tasks: gather information, provide information and radiate good will. It’s a common misconception that last two items apply only to full time / captive resources. In reality they are possibly even more important in offshore scenario as resources come from the same pool. If you fall short on radiating good will it is likely to backfire in later stage of the project, a mistake I made a few times and paid for dearly. Your candidates have two masters to please. That affects everything in the way they present themselves from speech patterns to content of the answers. Time differences / lack of clarity / procedural hurdles will work against the candidate as well. Remote nature of the interview work against both parties. Go there and interview your candidates face to face; if that’s cost prohibitive consider solid conferencing tools, at least webcam on both sides. Invest diligently in the interviewing process and ensure that your vendor buys into it. Make sure that the vendor does good job in sourcing the candidates and communicating the job requirements as well as promoting the good will. Make sure that vendor representatives are involved in the interview process and not only at administrative level. As you select team members get them involved in following interviewing activities. After each interview run a quick retrospective concentrating on process and candidate quality improvement. Of course this is just a superficial overview of the subject. Interviewing in general is a very complex task, requires lifetime learning, and is one of the most important factors in managing successful offshore engagements. The good part about it is we get a plenty of chances to learn it. Just red IT offshoring is exaggerated and the IT labor shortage is real by Jason Hiner, a very interesting perspective that should both appease local IT professionals and offshore providers: “…new evidence shows that the IT offshoring trend is greatly exaggerated. The Society of Information Management’s 2008 IT Trends Survey shows that IT leaders are planning to increase offshore outsourcing in 2009, after two straight years of declines. 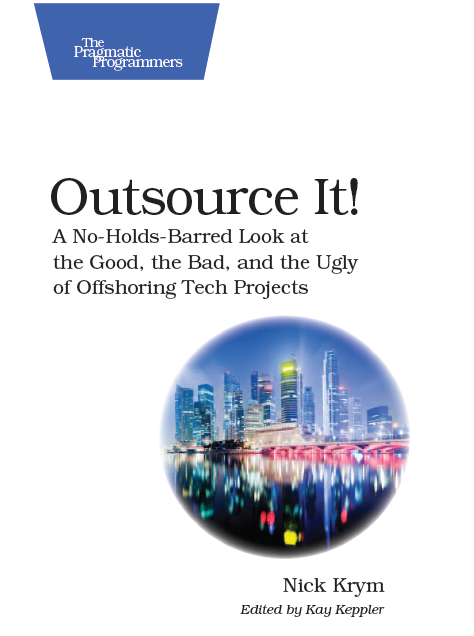 Nevertheless, even with the increase, offshore outsourcing only represents five percent of projected 2009 budgets, and CIOs say they are still having trouble finding enough domestic IT workers with the right mix of skills to fill the open positions that they are keeping at home.” The article of course spawned a bunch of negative comments as any realistic, positive or pragmatic view on offshore would. I find it very insightful and very much in line with my observations of the market. This discussion is bound to continue for a while, here is another interesting article / reaction to Hiner’s article: Offshore Threat to IT Jobs: Overblown or on the Money?